Throwing the perfect birthday party all begins with choosing the right invitation. Our collection of kids birthday party invitations features some of the best designs and most colorful patterns imaginable. Brighten up any child's birthday party with the right invitation from Polka Dot Design with the cutest birthday invitation message. Selecting the right wording for your invitations can be just as important as choosing the right design. We've taken the guesswork out of kids birthday invitation wording and compiled a list of some of the best phrases to make your invite not only stand out, but feel a bit more personal. We also carry customizeable kids stationery which makes for a beautiful gift for any occasion. What better way to honor the child in your life than with providing them with their own stationery? Encourage both writing and self-expression with our arrangement of kids personalized stationery. Perhaps you're looking for something a bit smaller than packs the same celebratory punch. Our gift tags for children are another great way to jazz up any outgoing correspondence. Adorn your invitations with a customized sticker for a more personal feel every time. We want you to be completely satisfied every time you browse our assortment of invites cards. Whether you are looking for a cute, colorful invite, or a more gender-specific invite, allow Polka Dot Design to be your trusted source every time. Kids birthday party invitations are a dime a dozen. If you've googled party invitations for kids and landed here at polkadot invitations, well you're in the right spot. Sometimes we just need a kids wording idea rather than just the design and polkadot can help you with that. There are so many child party themes to choose from these days in the world of Pinterest and Etsy. We can help you enjoy your child's party and come up with working ideas that'll make your child smile. If you're looking for kids food ideas or birthday recipes you can check out our Pinterest page. One good theme idea would be a pirate party. Pirate parties for boys are great as every little boy wants to be a pirate. 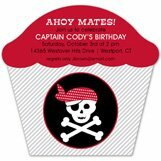 Polkadot has party invitations for pirates and other ideas right here in your favorite stationary store. You can simply enter our design studio and customize your own invitation online. Custom printed invitations are a great addition to any birthday party for young boys or girls. Whether they're turning three or it's their first birthday and you just want to celebrate their first year on earth, we will help you decide what design to choose. Another party theme for your child's birthday party is Hello Kitty. While we cannot create Hello Kitty party invitations since they're owned by Disney.com, we can create invitations with cats on them. Meri Meri Partyware does sell Hello Kitty party supplies though in our party ideas section online. Order your birthday invitations online and save up to 20% or get free shipping with a Polka Dot Design promo code. For more information, contact us at service@polkadotdesign.com or call the Polka Dot hotline 1-877-816-0884 if you need help on how to write a birthday invitation or where to have kids birthday party.